A great range of activities! 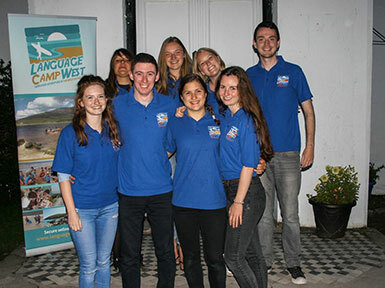 Language Camp West offers a wide range of indoor, outdoor and social activities. Our camp counsellors will keep students busy and entertained throughout their stay. Combining conversational language practice with sports and social activities makes language learning so much easier. Students will soon forget that they are speaking a foreign language as their confidence grows. Our activity partner, Achill OEC, places each student under the supervision of qualified instructors. The ratio of students to instructors is 8:1. In addition, the students assigned camp counsellor takes part in all activities to ensure not only that the chosen language is put into practice, but that the safety and security of each student is fully supervised. To learn more, please read our Parents Guide. Movie night, Barbeque, Achill's Got Talent Show, Blind Date, Card Games, Quiz, Arts & Crafts, Karaoke, German or French Cooking Lessons, Treasure Hunts and more! Achill is the largest island off the coast of Ireland and is bridge-linked to the Curraun Peninsula at Achill Sound. Covered in wild mountains, lakes and undulating open moorland, Achill Island is blessed with dramatic cliff scenery, stunning coastline, fresh air and pure water. Its unique beauty is unequalled anywhere. Five of Achill's gorgeous beaches carry the European 'Blue flag', confirming their quality and status. 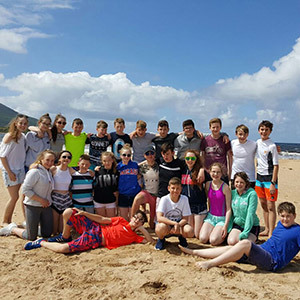 Achill Marathon, Give it A Go Event, Seafood Festival, Scoil Acla Irish Music Festival, Yawl Racing Festival, Painting Schools, Heinrich Boll Memorial Weekend, Archeological Summer School. Magnificent scenery - The Atlantic Drive, Minaun Cliffs, The Golden Strand, Slievemore, Keem Bay, Five Blue Flag Beaches, The Deserted Village, Granuaile's Tower.